Tribeca is known for its culture and history. Named after “Triangle Below Canal Street”, the former industrial buildings turned into upscale residential lofts have been home to many celebrities such as DeNiro, Gandolfini and Letterman; host of the Tribeca Film Festival, this neighborhood in Lower Manhattan has a bohemian chic feel to it. It is here where Herzog and DeMeuron designed an iconic tower in 56 Leonard Street; the vertical glass expression of sculpted surfaces, cantilevers and sparkling glass, that will certainly mesmerize not only the Tribeca residents but Manhattan and the world all around. With 145 spatially innovative visible homes stack upon one another cascading over the 60-story structure, custom-built for every resident with window walls up to 14 feet and private outdoor spaces that reveal breathtaking views of the city, you will want to buy an apartment like a custom-made suit. And, as if it were not enough, these spaces have a convenient system of purchase online that make them really easy to buy. 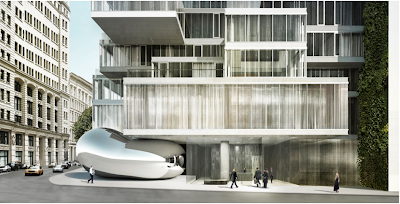 The project also features a perfect joint work with the well-established artist Anish Kapoor, who manages to integrate the building with the street surroundings, which is a clear relation to the closely cultivated synergy of art and architecture.